These and other posters were used during the nine-month long muktijuddho (Bangladesh War of Liberation) in 1971. 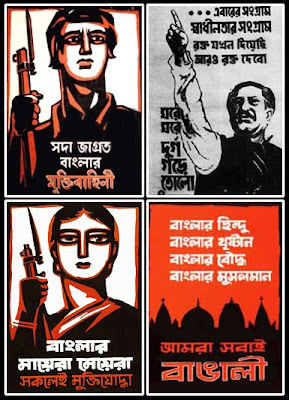 The above posters are: First Row (left) -- Shoda Jagroto Banglar Mukti Bahini (The ever-vigilant freedom fighters of Bengal). The picture shows a male freedom fighter holding his firearm with determination; (right) -- "...Ebarer shongram shadhinotar shongram, rokto jokhon diecchi aaro rokto debo" ("...the struggle this time is for the independence; we have already shed some blood, we shall shed more blood in future"). The picture depicts Sheikh Mujibur Rahman who had told those fiery words during his historic speech on March 7, 1971 in Dhaka. Second Row (left) -- A courageous female freedom fighter holding her firearm and the writing says: Banglar maera meyera shokolei muktijuddha (Mothers and daughters of Bengal are all freedom fighters); (right) -- Banglar Hindu, Banglar Christan, Banglar Bouddho, Banglar Mussalman -- Amra shobai Bangali (Hindus, Christians, Buddhists, and Muslims of Bengal -- We are all Bangalis (Bengalees). Third Row: A demon represents the evil forces of the then West Pakistan and the writing "Annihilate these demons" gives a clarion call to fight and exterminate those forces. 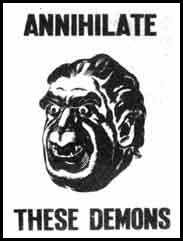 This demon poster, done after the facial features of General Yahya Khan -- who had unleashed military forces on the Bangalis and people of other ethnic groups in East Pakistan (later Bangladesh) -- was drawn by renowned Bangali artist Qamrul Hassan. Posters are used for a cause. That's why posters can be seen everywhere. They have been proven to be an effective medium to carry on the message. Posters inform, educate and increase knowledge base of people. Posters can entertain people. These can awaken, inspire and motivate people, too. They can help mobilize public opinion. Posters can also appeal to the emotions of people. They can work as an effective propaganda tool, too. Posters can remind people of their responsibility and duty. Posters can call for making a greater sacrifice for a cause. Posters also tell a story of a time -- that's what is history. Posters played an important role during the Bangladesh War of Independence in 1971. They performed all the above-mentioned functions. That's why their role is still appreciated in the independent Bangladesh. We, on this 39th anniversary of Bangladesh's independence, salute the creators of these posters. Although we don't know all the creators of the above and other posters in 1971, they have been a great service to the nation. May God bless them.